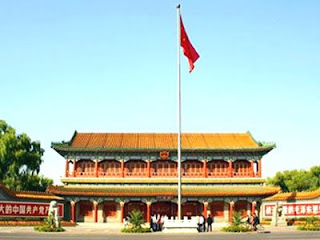 Xinhuamen (新华门), or the Gate of New China, is the main entrance of Zhongnanhai, the secretive compound that houses the leadership of both Communist Party and the central government of China. Just west of Tiananmen Square, Xinhuamen is not a place that attracts a lot of attention. The gate itself was converted from a building when the compound needed an easy access to the Chang'an Avenue outside of its red wall on the south. The gate is decorated by two giant sloans on each side. The one on the left says "Long Live the Great Chinese Communist Party!" and the other says "Long Live the Victorious Mao Zedong Thought!" The front door of the gate is always open with a pair of soldiers standing guard all the time. Padestrans are always advice to keep their distance. During the 1989 student movement, Xinhuamen became the focal point in the first nights of protest. As early as April 17, thousands of students gathered in front of the gate to demand an audience with Premier Li Peng. The crowd was finally dispersed in the wee hours of the morning. But they returned the next evening with even more forces and determination. They actively engaged in a push-and-shove game with the guards for hours. Student leader Wuer Kaixi made his first public appearance that night on the scene and impressed many people with his courage and determination. Police finally broke through the crowd and forced the protesting students into buses. Many people suffered minor injuries during the scuffle. Exagerated accounts of the events were then public displayed as the "April 20 Tragedy" among the many college campuses in Beijing. A month later, Xinhuamen also became a site of hunger strike when a group of teachers and students from University of Political Science and Law broke from their main camp in Tiananmen Square and staged their own hunger strike here. They effectively shut down this entrance for weeks. During the day of June 3, a van carrying military weapons was discovered on Chang'an Avenue just outside of Xinhuamen. Students ceased the vehicle and displayed the guns on its tops. Around noon, police charged the crowd with tear gas and recovered the weapons. It was the first time tear gas was used.